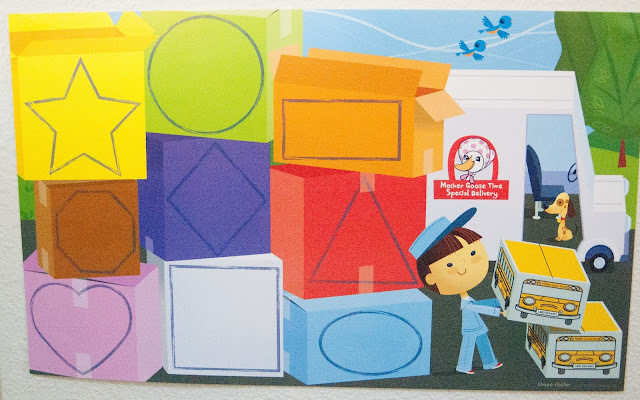 I got my Mother Goose Time box a few weeks ago but hadn't gotten it out yet. Realizing that September is really close I opened the box to start setting up the "classroom" for school. My living room is another name for what we call our classroom. They have some really neat and new stuff this year and some of the old classics from last year that are great as they are. First the weather charting system. This is everything that came in the box for the weather. Stickers, Sunday through Saturday, cardboard colorful tubes and sticks. 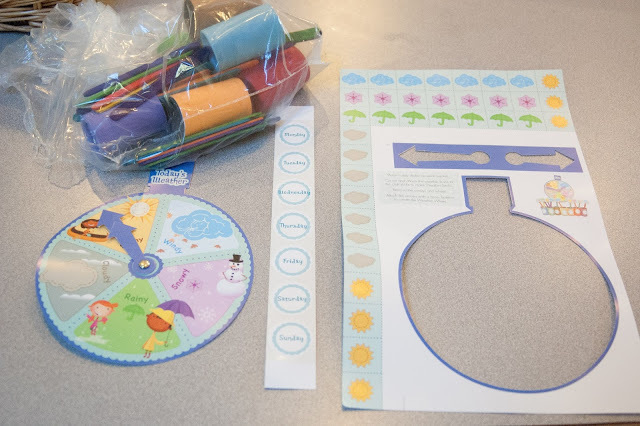 You take the weather symbols, cut them out and glue or tape them to the sticks. You can see it better in a later photo when you see them all done. This way we both have a weather dial to show us the weather that day but also a way to track the weather all week and look for patterns. That and we can talk about what the weather was like yesterday or what they think it might be like tomorrow. Those words are a little tricky for Lachlan, he uses yesterday for anything that happened in the past. 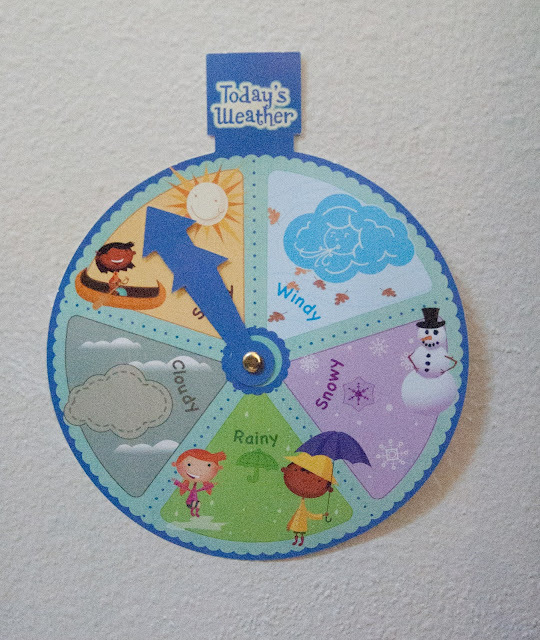 Here is the weather dial up on the wall. 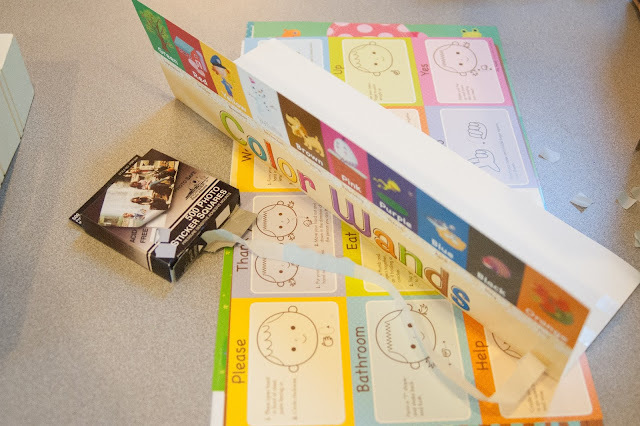 I used these double sided sticker squares sold in the photo scrapbook aisle to tape together the Color Wand display on the edges. So far it is holding. This is the shapes poster. Lachlan has already walked up to it and told me a story about how this is the guy that brings us our school stuff. 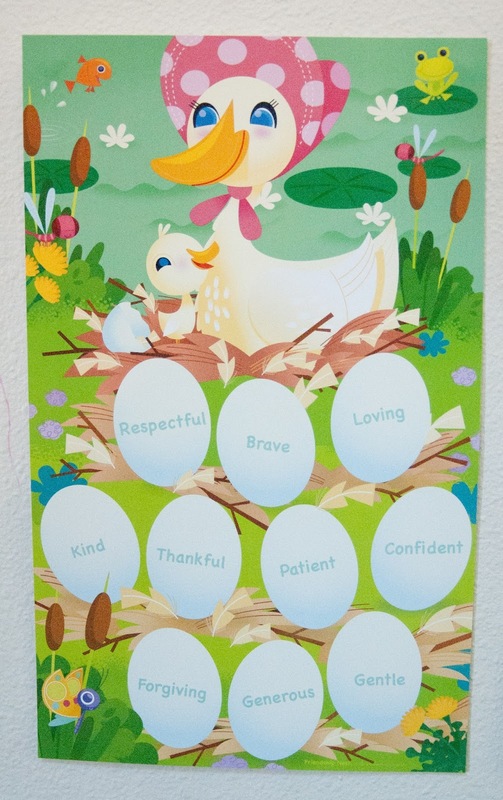 The Friendship Nest Poster will display a new word each month. A life value or a character trait that we will be focusing on that month. September's says "I am Loving" on a picture of a little gosling hatching. The Color Wand display is a pocket that we will put our color wands in. 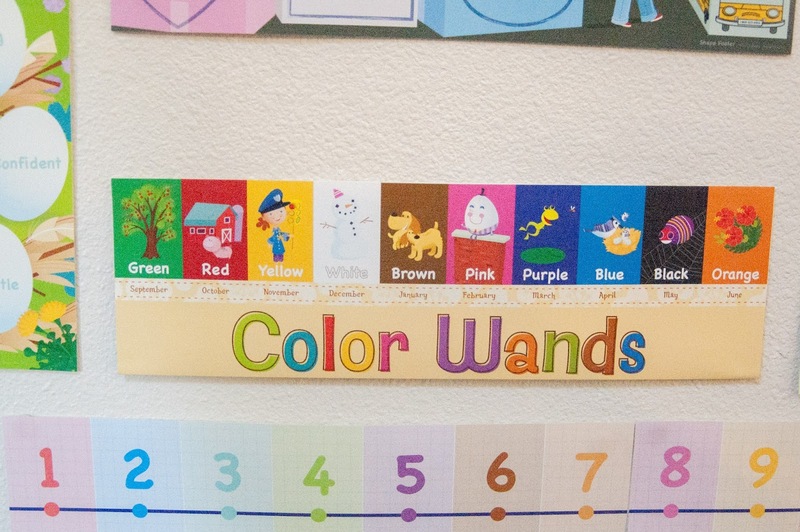 We learn and focus on 2 colors each month. September will be Green & Yellow. All of the close ups above are of the new displays. The calendar and number line are the same as last year. They work so well, so no change necessary. You can see the colorful tubes with their day of the week stickers on them. We got these out on Friday and the kids could not wait to use them. We did Friday's weather and then tried to remember what Thursday's weather was and the next day did Saturday's weather. The brown colored tube threw me off to the fact that it was a complete rainbow. I should have put them in order, but oh well. We have the first day of school marked on the calendar with the post it. I still have August up because today is technically still August, but sometime this weekend I will put up Septembers calendar and remark the first day of school. We mark many special events coming up this way. This wall is in our dining room. Everything here is also the same as last year. The map, the sign language poster and the Healthy Plate poster. Every month we usually have at least a day where a country is tied in with the lesson and we get a new flag. There is also a food group we learn about every month. Not pictured is the Alphabet poster which is also the same, but I am so thankful for a new one. Baby Cody was put in his exersaucer a little too close to the poster and has ripped it down a couple of times and chewed on it a bit. I put the new one up and have to remember NOT to put him so close, that kid has sticky hands, he can grab onto anything. 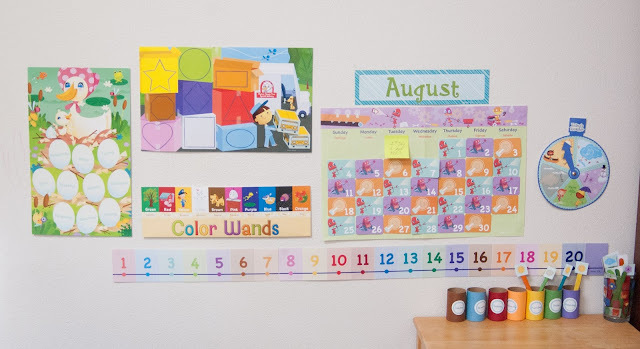 I have not put up the Little Helper Chart quite yet, I think I want to hang it and use clothes pin with their names on it to mark their chore for the day. I have been trying to figure out how to do this and I think an idea just came to mind. If I put a strip of cardboard down the middle of the chart it will bring it off the wall just enough to get the clothespins on there. Perfect, that's what I will do. I am so excited to get the school year started, even though I never really took time off all together, we did slow down quite a bit for summer. September's theme is Me and My Family. Broken up into 4 parts: Who is in your family? What are your feelings? Who are your friends? What pets do you have? We are learning the letters M, T & A and the numbers 1, 10, 11. The shape is a Circle and again the colors Yellow & Green. 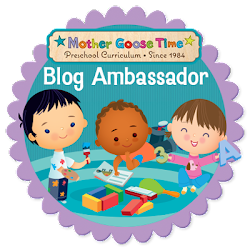 What I have really enjoyed about MGT is that even my youngest at 2.5 can very easily join in and has done so since May when we started with MGT. He still surprises me with things he knows, already. When I told Lachlan his first day of school is coming soon Peter piped in and said "and me too!" Yes bud and you too. Peter doesn't really know anything different than school everyday, its part of his life and he loves it. I can't wait to see what we all learn this year.